I recently stripped down some old 6-volt and 12-volt wiper motors to rebuild them. Apart from tinkering with wiper motors in the past, I have not given them close attention. 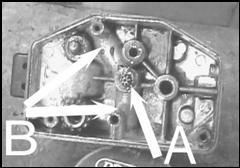 As with most used Austin Seven parts, they were all seized to a certain extent. I took out all the drive gears to just leave the motor in place so I could still run the wiper. I then noticed two ‘tubes’ that are part of the wiper case casting. These tubes both run from the centre of the wiper shaft to the outside of the case. Both tubes then have a small oiler that has a small ball bearing in the end. These oilers, when encrusted with dirt and paint, look like an old rivet or screw. Have a look at the pictures to see what I mean. 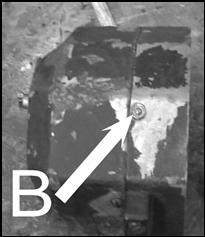 The picture above shows the inside of the case with the motor drive gear “A” and the two tubes “B”. The two pictures below show where the oilers are located, both marked “B”. Maybe there are two oilers so that the wiper can be fitted either way up, or is it to allow the oil to be put in the top oiler, and then open up the bottom oiler to encourage the oil to run down the tube? 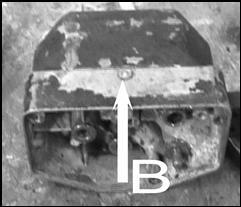 The two pictures below show where the oilers are located, both marked “B”. Maybe there are two oilers so that the wiper can be fitted either way up, or is it to allow the oil to be put in the top oiler, and then open up the bottom oiler to encourage the oil to run down the tube? Once these old units had been cleaned and oiled they all ran perfectly. This article, written by Lee Webster, originally appeared in CA7C Seven Focus in Apr 2007 p20.